Nissan is characterizing the new TITAN XD as a “new class” of pickup, falling in between the traditional half-ton pickup truck and the heavy-duty pickups. Their goal was to blur the lines between the two and combine strong points from both types into one all-encompassing package. The first thing you notice about the TITAN XD is that it’s big—really big. This truck has a commanding presence that’s hard to understate. I suppose if Nissan wants to play with the big boys, a runt of a pickup wasn’t going to cut it. In order to generate the hauling prowess capable of competing with the other heavy duty choices, size was going to be a necessity. The TITAN does achieve the towing and hauling capacity of the larger, more expensive heavy-duty trucks with a maximum tow rating of more than 12,000 pounds and maximum payload capacity of 2,000 pounds if you choose the proper options. It’s big, but it’s also beautiful. In fact, I’d go so far as to say it’s one of the nicest-looking trucks on the market. There are a quite a few similarities to the previous generation Ford F-150 in both front- and rear-end design, but it’s different enough to distinguish itself nicely. The truck generated more than its fair share of head turns while driving around town. The $76,795 test vehicle was the top-of-the-line Platinum Reserve edition equipped with the Cummins 5.0-litre, turbo-diesel V8 rated at 310 horsepower 555 lb.-ft. of torque. It’s a powerhouse, but also very smooth to drive as advertised. Comfort is another strong point in the TITAN. The interior is among the best I’ve had the pleasure to sit in (and I’ve sat in all of them). It’s a good thing because if Nissan wants this trim level to go up against the likes of the Ram Laramie Longhorn and F-150 King Ranch editions, it needs to be. The Toyota Tundra 1794 Edition I had a few weeks back wasn’t at this level, but the TITAN Platinum really blew me away. 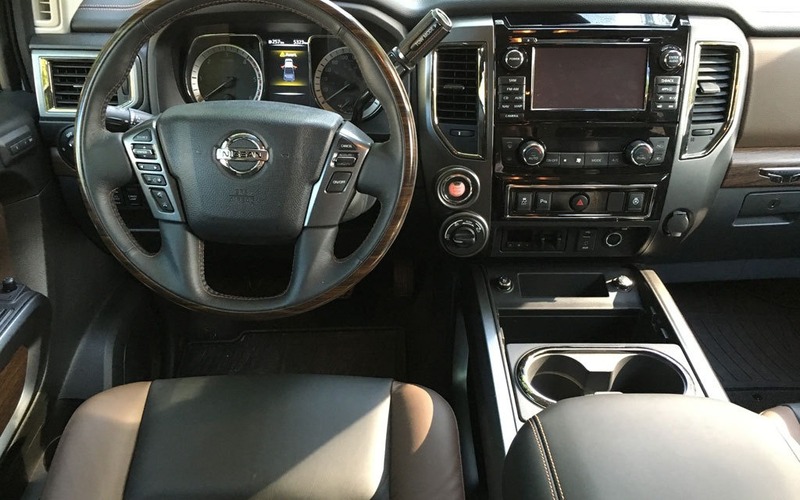 The rich leather aroma, beautiful woodgrain paneling and seats as comfy as your living room recliner won me over. Similarly I liked the old-school column-mounted shift lever beside the steering wheel as opposed to some of the silly buttons that are unfortunately becoming more and more common. The positioning frees up more space on the centre console for a laptop or clipboard. TITAN XD features available dual lockable, in-bed storage boxes that sit sight-unseen at street level and can hold a wide range of equipment. The boxes are watertight (and drainable) and can be used as a cooler for picnics or tailgating. They are also removable for times when extra bed capacity is required. 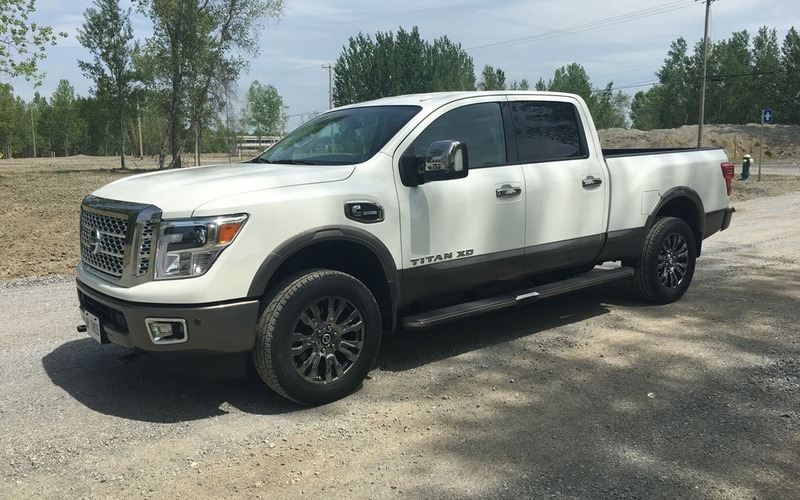 If you’re not in the market for the top-of-the line truck, the TITAN can also be had in the following versions each available with either a gasoline of diesel powerplant: S, SV, PRO-4X and SL. Pricing starts at $45,900. Unlike the Americans and Toyota, all TITANs come in Crew Cab form with four doors. So has Nissan achieved its goal of a new class of truck? I’d say they most certainly have. The TITAN was smooth enough for my wife to drive and is certainly rugged enough for any commercial workload. Add to this the top-notch interior and decent fuel economy and the truck makes for a real alternative to the big three.